The war of words between CEO of Housing.com, one of India's hottest startups, and managing partner of the country's most active venture capital firm reverberated on social media with some finding an opportunity to take a jibe at Sequoia Capital while others questioned the behaviour of the young chief executive. The issue was not limited to Housing.com's CEO Rahul Yadav accusing Sequoia Capital's MD Shailendra Singh of poaching staff but also on the talk about investors not having 'any say' in his own company. Meanwhile, there are also rumours of Housing.com's investors, who are now believed to own majority stake, looking for a new chief executive. Yadav, one of the dozen IITians who set up property listing site Housing.com in 2012, sparked what became a public spat, writing an email to Singh calling him 'inhuman and unethical', that was leaked on Quora. "I just came to know you personally are completely after Housing's employees and are brainwashing them to open some stupid incubation. If you don't stop messing around with me, directly or even indirectly, I will vacate the best of your firm," Yadav said in the email referring to Singh as 'dude'. The email was sent in retaliation to an offer that was made by Singh to one of Housing's employees to join Sequoia as an analyst. The VC firm had decided to expand its analyst pool to include younger team members who have startup experience. While the letter was subsequently removed from Quora, Yadav went on to pour out more aggression on the Q&A based networking platform: Here's a screen grab. "During my career in the valley, what stood out is a feeling of community - amongst entrepreneurs, employees and investors - and a sense of professionalism, not personalising the competition between funds or individuals, and having a drink together in the evening. For us, that means not being vindictive and petty and instead being collaborative with the ecosystem â€“ to focus on what matters in the long term," was Singh's reply to the mail. Some like Flipkart co-founder Sachin Bansal took a jibe at Sequoia. Replying to a tweet on his response, Bansal tweeted "@sequoia isn't an investor with us. I would just say that I'm glad to have it that way." One can look at it as a personal statement of an entrepreneur recalling a past funding pitch to a VC which did not materialise, though we must admit we don't know for sure if Bansal had something else in mind. Others had laugh at the expense of both sides: "Housing.com spends Rs 50 crore telling us that '^' means 'looking up', and then 50 seconds in clarifying that it actually means 'up yours'," tweeted Mahesh Murthy, a venture capital investor who does not shy from sharing his opinion publicly. But some did not like the episode. 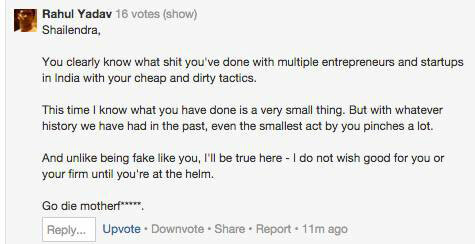 An angel investor labelled the act as "extremely disgraceful". "This is symptomatic of the ills of unbridled growth and limitless access to capital. I do not have a problem with Yadav being possessive about his employees. The desire to keep his flock together is a good sign. But there have to be limits to indecency in public behaviour. If I were a Housing investor, I would be worried today," he said. "The tone and tenor of Yadav's email outburst was both unprofessional and unbecoming from someone who leads one of the high potential startups. Housing.com spent a good chunk launching their 'rebrand' campaign with four-page ads in national newspapers this week. However, its leader's tempestuous acts could risk damaging the company's reputation and brand," said Ravi Gururaj, co-founder, Frictionless Ventures. He also mentioned that along with the big cheques from investors, comes an obligation to act responsibly as a leader and Yadav needs to act with good judgment while retaining the big doses of chutzpah that Housing.com has always demonstrated throughout its existence. "Normally in similar circumstances heads would roll. I hope the board offers him a reprieve," Gururaj said. Notably, a report in The Economic Times, said investors are looking to replace Yadav as CEO citing unnamed sources. Denying that he is being replaced Yadav replied to the newspaper that some senior hiring is taking place for specific functions who may sport a CEO designation as a unit head and added: "There is no investor say in the company; I run it and take all the calls." This may not go down well with its investors which includes SoftBank, Falcon Edge Capital, Helion Venture Partners, Nexus Venture Partners and Qualcomm Ventures, among others. Officially, they do maintain that Yadav is not being upstaged. Ashish Gupta of Helion told Techcircle.in that there is no such plan. The other issue is whether poaching itself is such a crime for which a chief of one firm has to go sent an acerbic letter to the head of another firm. It can be an emotive issue, especially for a young startup founder trying to build his venture, but then hiring from another firm is how the business of talent operates. In a market starved of skilled personnel, it is not unusual for people to offer more than others to hire and Housing itself has been doing that. To be fair, however, it has been more attuned to get skilled freshers and we don't personally know of many examples of it poaching from another company. Indeed, in one of the panel discussions at Orios Venture Partners' annual day, Zishaan Hayath, co-founder, Toppr.com, and also an investor in Housing.com, brought out the issue of dearth of good product managers in the industry. He said, "Whenever we send out an offer to a product manager, Housing.com offers 2x to hire them."